How to find all the indexes that have included columns in it and the name of the table to which the index belongs to? Great script! Thanks. Saved me time! 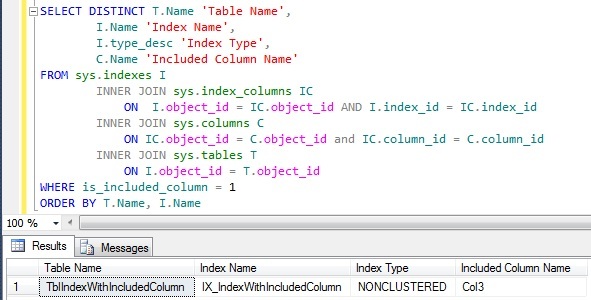 Thank you SO much, I had been trying to search fro some queries which could fetch me the Index on a particular table with INCLUDED COLUMNS name and yours suggestion is the one, which workd for me… Thank you so much!! In other’s blogs, the queries were too huge and seemed very complex and unnecessary.